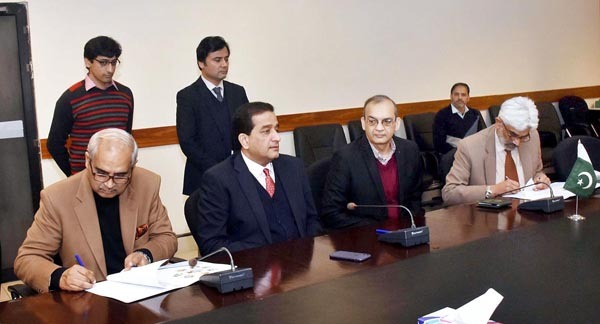 ISLAMABAD, Jan 31 (APP):Ministry of Climate Change and National Rural Support Programme signed Memorandum of Understanding (MoU) to strengthen CleanGreen Pakistan Movement, Advisor to Prime Minister on climate Change Malik Amin Aslam witnessed the signing ceremony. The core objective of the MoU is to form a “ Challenge Fund for Climate Smart Project “ wherein National Rural Support Program will Finance Rs 100 million for the smooth implementation of Ten Billion Tree Tsunami Project, said a press release. Advisor to Prime Minister on Climate Change Malik Amin Aslam said to implement CleanGreen Movement in letter and in sprite, it is prerequisite to utilise modern and sophisticated drone technology so that the plantation campaign expand to the larger territorial terrain where human access is difficult.